After a long time without updating the creator of this mod is back on the project and we can enjoy its various features today. 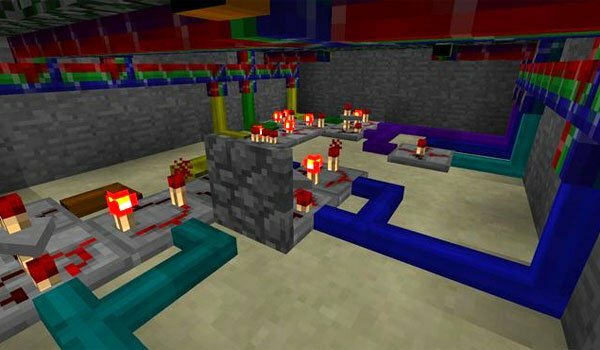 RedPower 2 Mod 1.4.7 adds a good variety of new features, perhaps the most remarkable of all is the option to use the same wiring redstone function, with the difference that the wiring can be placed in any position (also vertically), plus 4 colors for wiring, which is much appreciated for different lines within systems. Definetly, a marvel mod for Redstone lovers. Beyond that, this mod adds new minerals and materials, various colors of lights, elements of circuitry and logic gates. This also adds mod pipes for liquids and objects, as well as a host machines really useful for complex automated systems infinity. This mod consists of several parts, so they should be download the four parts individually from the second point of the installation tutorial. How to install RedPower 2 Mod for Minecraft 1.4.7? Download RedPower Core, RedPower Digital, RedPower Mechanical and RedPower Compat.